Skagerrak haze table lamp is a lampshade sewn in a semi-transparent laminated mesh of white threads wich forms a grid pattern. 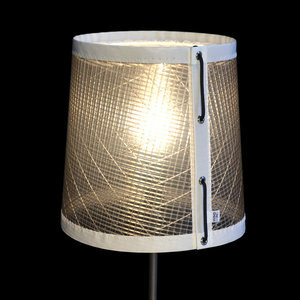 The lampshade is held together by a thin black rope threaded through eyelets. It has a claw attachmemt to put directly on the light source, which makes it fit most lamp stands. The light gives a silvery appearance through the shade where the luster of the laminate reminiscent of sparkling sunlight in ocean waves.